The Grand Haven Acacia Outdoor Patio Set by Factory Buys Direct takes takes entertaining to a whole new level. 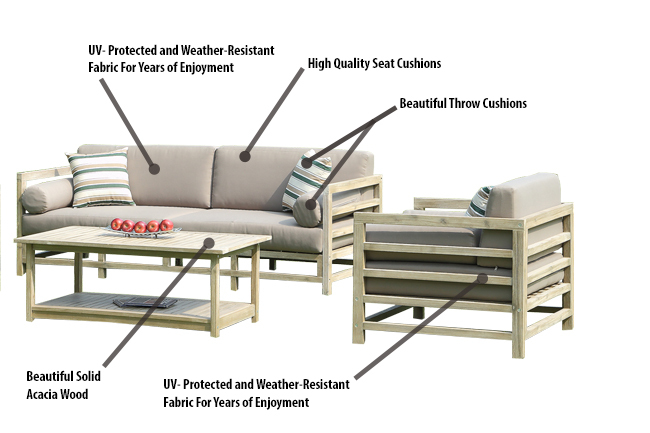 The Grand Haven patio set, with extra thick cushions and a plethora of throw cushions, offers all the benefits and style of an indoor furniture set with the durability of Acacia wood to be kept outdoors. The stylish modular design fits any space and the open construction side rails allow for maximum air flow to stay cool on those hot summer days. High quality construction and hardware provide year after year of worry free use. Acacia wood is ideal for indoor and outdoor patio furniture because of it's durability, hardness and moisture resistance. In addition, Acacia is very hard and heavy so it is perfect for everyday use. These properties, which are similar to teak patio sets, allow acacia patio sets to be very long-lasting, and able to hold up well when used outdoors.